Aluminum is one of the most commonly used metals in the manufacturing industry. Bauxite, from which it is obtained, is also one of the most abundant metallic ores found in the earth’s crust. It was discovered around the 1800’s and has been in use to date. The most interesting fact about aluminum is that of all the deposits that have been mined and used, almost half of it is still in active use today. This speaks greatly of its durability and sustainability. No other metallic ore in the earth’s crust has such a record. Aluminum recycling has also been around for a considerable period of time. Historically, this was not such a common process and the fact that recycling processes were not so efficient made it less popular. Aluminum was being used for several processes in the manufacturing industry. Majority of it was sunk into the food industry for canning material, while the rest of it was pushed into the vehicle manufacture industry and aerospace, for the production of light and durable parts. However the entry of aluminum cans for packaging of soft drinks changed everything. This was around the 60’s in the 19th century. From this point forward the industry exploded. The results of prior research indicated that the production process of 16 recycled soda cans was almost equal to the production of 1 new soda can from virgin aluminum. There was no turning back from this point forward. All efforts were placed to ensure efficient recycling processes and a reduction in the required virgin aluminum for canning containers. Aluminum recycling, unlike the production of new virgin aluminum metal has great financial results in terms of savings for the aluminum industry. While this is not the only metric taken into consideration, it is what has changed the minds of everyone towards the process of recycling aluminum. Other variables taken into measurement include the mining costs, environmental concerns and the logistic processes of shipping and moving around the bauxite ore. For majority of countries all around the world these metrics mean a lot and recycling is therefore a great measure to ensure sustainability and efficiency is met. Energy consumption and saving – the process of extracting aluminum from its bauxite ore requires a considerable amount of energy. This process is twofold; meaning that the manufactures have to first produce aluminum oxide then convert it to aluminum through the combustion of thermite. The interesting metric here is the amount of energy used up in the process of recycling aluminum. Research and calculations indicates that you only need about 5% to 6% of the energy used in production of virgin aluminum. 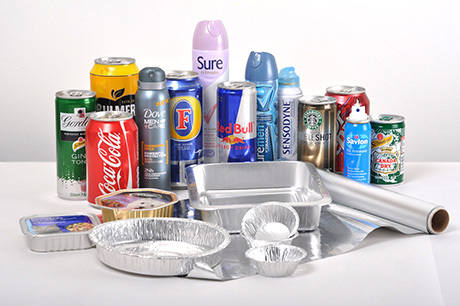 Environmental concerns – taking into consideration the aforementioned percentage of energy utilized in the production of recycled aluminum it will only make sense to say that comparatively, the world would be a cleaner and safer place if we recycled more aluminum than if we produced new ones. This is in respect to the amount of carbon dioxide and other elements that will be released into the atmosphere due to the process of combustion of fossil fuel. This also translates to the amount of care that is taken to ensure that there is efficient production of the metal to ensure that percentage losses are minimized in the process of creating virgin aluminum. The advantage in terms of usage for aluminum metal continues to grow every single day. Such is the popularity that we have seen many industries using it in the production of parts and components such as the motor-vehicle industry, the aircraft parts industry, computers, bike parts, military equipment and even cooking material.